"ASIN" redirects here. For other uses, see Asin (disambiguation). random numbers, selected from a number space much larger than the maximum number of objects to be identified. Although not really unique, some identifiers of this type may be appropriate for identifying objects in many practical applications and are, with abuse of language, still referred to as "unique"
names or codes allocated by choice which are forced to be unique by keeping a central registry such as the EPC Information Services. The International Article Number is a standard describing a barcode symbology and numbering system used in global trade to identify a specific retail product type, in a specific packaging configuration, from a specific manufacturer. The standard has been subsumed in the Global Trade Item Number standard from the GS1 organization; the same numbers can be referred to as GTINs and can be encoded in other barcode symbologies defined by GS1. EAN barcodes are used worldwide for lookup at retail point of sale, but can also be used as numbers for other purposes such as wholesale ordering or accounting. A9.com is a subsidiary of Amazon that develops search engine and search advertising technology. A9 is based in Palo Alto, California, with teams in Bangalore, Beijing, Dublin, Iași, Munich and Tokyo. A9 has development efforts in areas of product search, cloud search, visual search, augmented reality, advertising technology and community question answering. OpenSearch is a collection of technologies that allow publishing of search results in a format suitable for syndication and aggregation. It is a way for websites and search engines to publish search results in a standard and accessible format. Radio-frequency identification (RFID) uses electromagnetic fields to automatically identify and track tags attached to objects. The tags contain electronically-stored information. Passive tags collect energy from a nearby RFID reader's interrogating radio waves. Active tags have a local power source and may operate hundreds of meters from the RFID reader. Unlike a barcode, the tag need not be within the line of sight of the reader, so it may be embedded in the tracked object. RFID is one method of automatic identification and data capture (AIDC). The National Drug Code (NDC) is a unique product identifier used in the United States for drugs intended for human use. The Drug Listing Act of 1972 requires registered drug establishments to provide the Food and Drug Administration (FDA) with a current list of all drugs manufactured, prepared, propagated, compounded, or processed by it for commercial distribution. Drug products are identified and reported using the NDC. International Standard Musical Work Code (ISWC) is a unique identifier for musical works, similar to ISBN for books. It is adopted as international standard ISO 15707. The ISO subcommittee with responsibility for the standard is TC 46/SC 9. The International Standard Recording Code (ISRC) is an international standard code for uniquely identifying sound recordings and music video recordings. The code was developed by the recording industry in conjunction with the ISO technical committee 46, subcommittee 9, which codified the standard as ISO 3901 in 1986, and updated it in 2001. Global Trade Item Number (GTIN) is an identifier for trade items, developed by GS1. Such identifiers are used to look up product information in a database which may belong to a retailer, manufacturer, collector, researcher, or other entity. The uniqueness and universality of the identifier is useful in establishing which product in one database corresponds to which product in another database, especially across organizational boundaries. GS1 US, a member of GS1, is an information standards organization that brings industry communities together to solve supply chain problems through the adoption and implementation of GS1 Standards. GS1 Standards are the most widely used supply chain standards system in the world. The barcode is scanned more than 6 billion times a day globally. The GS1 System of Standards provides for accurate identification and communication of information regarding products, assets, services and locations. "Bookland" is the informal name for the Unique Country Code (UCC) prefix allocated in the 1980s for European Article Number (EAN) identifiers of published books, regardless of country of origin, so that the EAN namespace can catalogue books by ISBN rather than maintaining a redundant parallel numbering system. In other words, Bookland is a fictitious country that exists solely in EAN for the purposes of non-geographically cataloguing books in the otherwise geographically keyed EAN coding system. Asin Thottumkal is an Indian actress. An EAN-8 is an EAN/UPC symbology barcode and is derived from the longer International Article Number (EAN-13) code. It was introduced for use on small packages where an EAN-13 barcode would be too large; for example on cigarettes, pencils, and chewing gum packets. 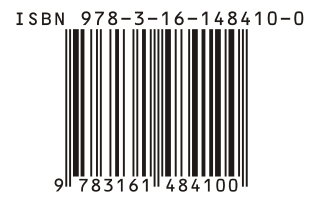 It is encoded identically to the 12 digits of the UPC-A barcode, except that it has 4 digits in each of the left and right halves. Unique Identification Marking, UID marking, Item Unique Identification or IUID, is a part of the compliance process mandated by the United States Department of Defense. It is a permanent marking method used to give equipment a unique ID. Marking is essential for all equipment with an acquisition cost of over $5,000, equipment which is mission essential, controlled inventory, or serially-controlled. UID-marking is a set of data for assets that is globally unique and unambiguous. The technology used to mark an item is 2D Data Matrix ECC 200 Symbol. UID marking can be used to ensure data integrity and data quality throughout an item's lifecycle; it also supports multi-faceted business applications. The Global Location Number (GLN) is part of the GS1 systems of standards. It is a simple tool used to identify a location and can identify locations uniquely where required. This identifier is compliant with norm ISO/IEC 6523. ↑ "Amazon.ca Help: Product Identifiers". Amazon.ca. Retrieved 25 May 2011. ↑ "FAQ: ISBN-13 for Amazon Associates". Affiliate-Program.Amazon.com. Retrieved 29 October 2014. ↑ "ASIN to EAN converter". erwinmayer.com.